Although the new capital of Meknes was meant to rival Versailles in its splendor, and was laid out by French city planners, it was also meant to showcase the art and architecture of Morocco—and in the process displays much of the personality of its founder. One of the architectural wonders of Meknes are the 15 meter-high fortress walls that he built for 45 km around his new city. Although much of the length of these walls was destroyed in an earthquake in 1755 (the same earthquake that destroyed Lisbon), those that remain continue to be a star tourist attraction to those interested in massive military architecture. 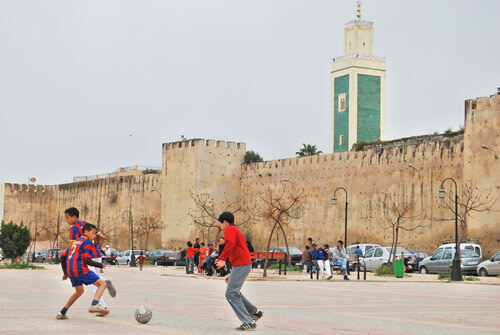 Today, Meknes is a thriving city of over a million people surrounding the "Versailles of Morocco." 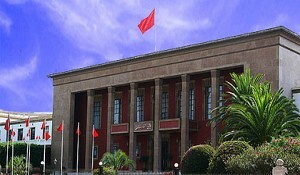 Besides being an Imperial City and major tourist destination Meknes is both a major agricultural center for the region, and a major crafts center. The story behind the walls is also of interest for the rest of the city design. Moulay Ismail ruled by fear, and he himself constantly feared uprising or attack.In his paranoia that his Berber subjects would rise up and attack him, Moulay Ismail not only fortified the city, but also stocked with supplies sufficient to withstand 20 years of siege. Thus two of the most impressive sites are the gigantic walls and tiny windows of the Heri as Souani or Royal Granaries designed to keep years of grain fresh, and the Royal Stables built to house 12,000 horses for his cavalry. Behind the stables is the Der el Ma, the so-called Water Palace, a reservoir large enough to provide water for the 12,000 horses, and the Agdal, built as a pleasure lake. Also to be seen is the Qara prison where the Sultan's 25,000 Christian slaves were kept. 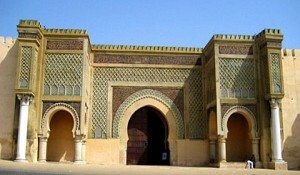 One of the wonders of Meknes is the main gate, the Bob Mansour, which opens into the main square of the city, the Place El Hadim. 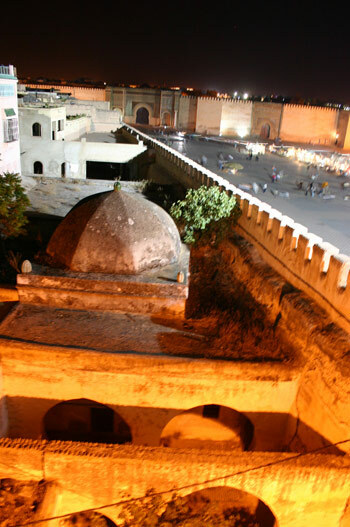 The Bob Mansour is one of the loveliest structures in North Africa, and was intended as the central gate to the city. Its inlaid tiles of Almohad patterns and zellij mosaics are stunning, as are its two marble columns taken from the Roman ruins of nearby Volubilis. The Bob Mansour is the work of the great architect and artist, El Monsour who, it is said, was executed upon its completion. The story is that upon inspecting it, Moulay Ismail asked El-Mansour if he could do better. El-Mansur reflected upon the question and replied yes, making the sultan so angry that he had him killed on the spot. Though the most beautiful, Bob Mansour is one of only six gates of the city to be seen on any tour. Immediately inside the Bob Mansour is the Place El Hadim square, intended to be one of the largest (30 acres) and most beautiful open city squares in the world. The plaza borders the medina or old market area that feeds into the square. 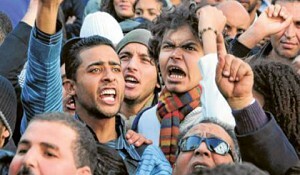 But the main attraction of Place El Hadim is its liveliness, which can only be conveyed by the video here. Among the other sights of Dar Al-Makhzen, which still functions as a royal palace today, and the Jamai Palace that today houses the Museum of Moroccan Arts. Not to be missed, of course, is the Moulay Ismail mausoleum, renowned for its architectural splendor, and the recently restored Mausoleum of Sidi ben Aissa, a holy man of Moroccan history. 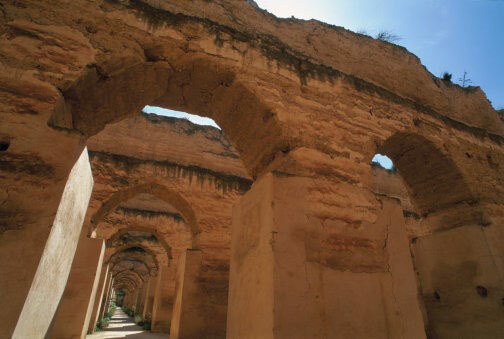 Meknes also boasts many outstanding mosques and madrasas—leading to the city's other title: City of a Hundred Minarets. 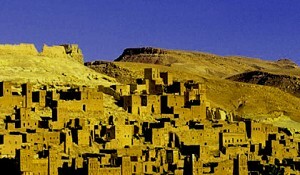 Meknes has furnished the backdrop for many major films, such as The Last Temptation of Christ. For a wonderful description of seeing Meknes and surrounding sights on a budget with fantastically good photos, see this blog. Volubulis. 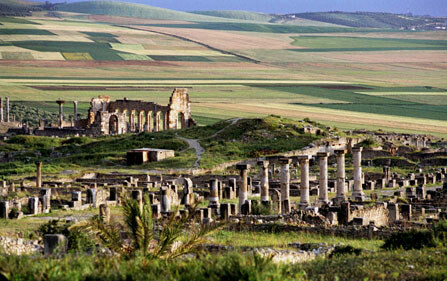 Only 30 km from Meknes lie the ruins of the ancient Roman city of Volubulis. This was a Carthaginian trading outpost, but when Carthage was destroyed by Rome, it became a Roman city which between 40 and 285 AD expanded spectacularly with public monuments, temples, and thermal baths. The walls of the were founded by the Emperor Marcus Aurelius in 168-169 AD together with 8 major gates. In the 4th century AD, the city declined as Rome pulled back its armies, but the town continued to be inhabited. Moulay Ismail took masonry from Volubulis to build his Versailles at Meknes. Today Volubulis is also a major World Heritage site. Moulay Idriss Zerhoun. Another site near Meknes is the holy city of Moulay Idriss, located 27 km from Meknes, harboring the sanctuary of the founder of the Idrissid dynasty (the first dynasty of Morocco and founders of Fez). Pilgrimage is made to this city every year for solemn celebration of the saint of this city. El Hajeb. Not far from Meknes, troglodyte dwellings cut into cliffs, gorgeous caves and gardens watered from countless springs make El Hajeb a delight to the senses and spirit that is a city-dweller's refuge and paradise, and an eco-tourist's dream. Ifrane. 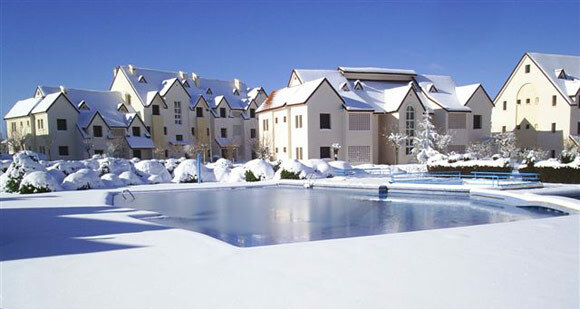 Known as the "Switzerland of Morocco," because of its European-style buildings and tree-lined streets, Ifrane offers what many call a "Savoyard landscape" for a delight of the senses. Offering skiing on the nearby mountains of Michlifen (2036 m) a and Jbel Heri ((2104 m), or red partridge and boar hunting in the valleys, and trout fishing in its mountain streams, Ifrane offers rugged mountain adventure or simply rambling. 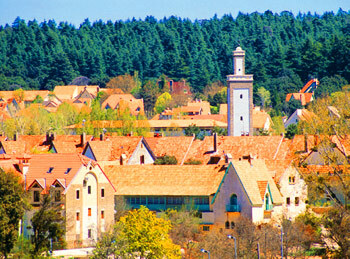 Ifrane is also the site of the famous American University in Morocco, Al Akhawayn. Azrou. Home to a craftwork center famed for its cedar woodworking and embroidery, as well as its salmon-trout farming. Today, Meknes is a thriving city of over a million people surrounding the "Versailles of Morocco." Besides being an Imperial City and major tourist destination, Meknes is both a major agricultural center for the region, and a major crafts center. More than 50,000 craftspeople live and work in Meknes, keeping alive age-old crafts and designs for carpets, embroidery, woodwork, iron, and leatherwork. Meknes is the only city of Morocco where damascening—inlaying of gold, silver, or copper—can still be found, as well as the authentic Meknassi style of cabinets, woodwork, and embroidery. 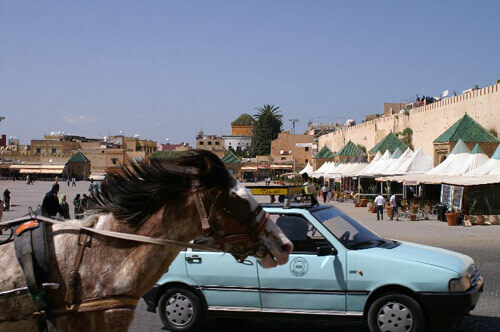 Meknes is also the center of a rich agricultural region featuring olive oil, wines and dates, as well as horse-breeding and trout farming. 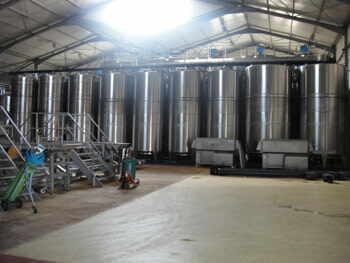 Its markets and agricultural trading and shipping facilities make it one of the outstanding destinations for both agricultural specialists as well as eco-tourists. 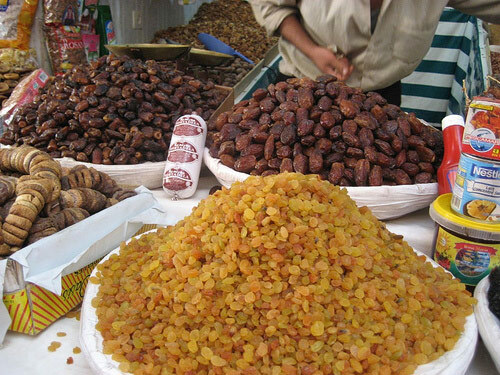 Located only 60 km from Fez, 130 km from Rabat, and 210 from Tangier, Meknes is ideally situated on good highways, rail lines, and airline routes to become not only a world class tourist destination, but also a world capital of agricultural, vinicultural, and ecological trade and treasures. 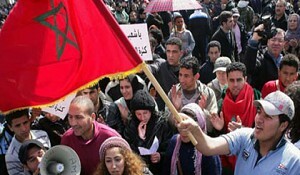 Morocco: The Western Kingdom — the "California of the Middle East"